I'm an authentic, open human being with a deep investment in helping people to find meaning and purpose amidst the chaos of everyday life. I welcome diversity including all body sizes, abilities, races, sexualities, genders, religions and political values. I specialize in helping women to observe, challenge and transcend the norms that are thrust upon them, in the hopes of finding their voice. I hold the belief that you are already the most insightful and knowing force in your life and my mission is to help you to listen more deeply to yourself, find your confidence and feel more fulfilled, connected and capable. 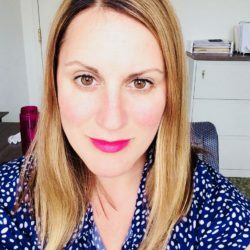 I am a licensed clinical social worker with 13 years of experience working with individuals and couples who are facing significant life transitions and struggles including depression/anxiety, pregnancy/motherhood, loss/grief and aging/illness. I’ve received post graduate training in Motivational Interviewing, Cognitive Behavioral Therapy, Emotionally Focused Therapy, Attachment Theory and Palliative and End of Life Care. Therapy sessions with me are collaborative and strengths-based, weaving in heartfelt doses of honesty and directness. In life, I am a genuine, warm and dynamic person, and that's exactly who you'll experience in our sessions. I believe that the most therapeutic relationships develop when you feel you can be congruent with who you really are. It is my firm belief that with the right kind of guidance and support, difficult transitions can bring about change, revealing new versions of yourself and helping you to find meaning in them. I am and always have been a feminist and I approach my work with the values that feminism engenders: challenging the status quo, seeking to understand and validate the unique and often invalidated experience of being a woman, and recognizing when falling into our own internalized misogynistic and binary belief systems. In continuation of these values I too challenge the norms of racial and gender disparity, continually educating myself through difficult conversations, workshops, readings and discussions with colleagues around how to be an active agent of change around racial disparity. I am currently advocating at the local grammar school level to integrate discussions around race and sexuality/consent. I am highly committed to affecting change on both the personal and institutional level. I am a white, heterosexual cisgender female, married to a man, and I have a daughter age 5, son age 2 and dog age 9. All five of us are “alphas”... indeed this makes for a lively household!! Pregnancy and motherhood is the most profound change a woman goes through. We all know how beautiful it CAN be… how fulfilling and transcendent. Yet what if it doesn’t feel that way? What if you have had a traumatic experience because of pregnancy loss or complications? Or what if it feels entirely overwhelming, or you are feeling sad, angry, even empty? Is there a place for you to authentically express these feelings, without judgement? I know how all-consuming motherhood can be and that it can trigger all sorts of self-doubt, old traumas/memories and most often, GUILT. You are not alone… I understand these experiences on a very personal, and professional level. I have studied and trained on early attachment as well as issues around PPMD. I can guide you through the intricacies of pregnancy and motherhood with compassion and skill so that we can work towards finding you peace, healing and confidence. Transformation is possible. I worked for a prominent cancer organization in nyc for 10 years, helping people of all ages to cope with illness, caregiving and loss. I have had extensive training in mindfulness, CBT and the psychology of grief/los, illness and death. It is my firm belief that Grief manifests itself throughout our lives whenever we face any type of current or past change or transition; motherhood, marriage/relationship shifts, career shifts, identity changes, etc...and if we allow ourselves to feel these losses, then process them, we can be freer to find joy and peace in the present moment. I find that when my clients are able to sit with the things that cause them pain, they are better equipped to fashion a life for themselves that feels congruent with who they really are.